Nicknamed the “Garden State,” New Jersey is a wonderful destination for experiencing the Victorian history found in Cape May, soaking up casino life in Atlantic City, or for balmy beach time along the Jersey Shore. With so many adventures to choose from, make it an extended vacation and stay in one of the many New Jersey vacation rentals. 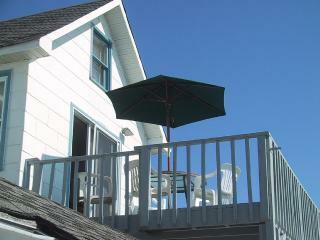 Vacationers often flock to New Jersey vacation rentals along the shore during the summertime. Temperatures during this time typically range from the low 60s to a high of 80 degrees Fahrenheit making it a pleasant beach destination. 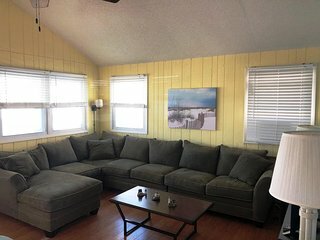 During the fall, the weather cools off a bit, crowds are smaller, and special rental rates are often offered for off-season Ocean City rentals. In the winter, temperatures span from the low 20s to the high 40s. There is much to see and do for visitors in New Jersey. If you’re staying near the beach, spend your days swimming, sunbathing, fishing and boating. Popular beach towns include: Cape May, Long Beach Island, Sea Isle City and Ocean City. In Ocean City, take a guided tour of Lucy the Elephant, a six-floor “walk-in” animal and a National Historic Landmark that is treasured by the state. In Long Beach Island, visit “Old Barney,” the Barnegat Lighthouse built in 1858. New Jersey boasts over twenty lighthouses along its coast, so you won’t have trouble finding one to see. For guests who like to see more than sand and surf, take a trip to Trenton for the opportunity to go back in time. The Old Barracks Museum here shows what military life was like 200 years ago. Head inland to Wheaton Village to see how glass is traditionally blown at the Museum of American Glass. Other popular activities include hiking in the New Jersey Palisades and exploring the Pine Barrens. Atlantic City is perfect for vacationers traveling without family. There are a number of casinos, including the Borgata Casino, Caesar’s Atlantic City Casino and Tropicana Casino, where you can test your luck all night long. The lively Atlantic City Boardwalk is another main attraction that boasts a variety of amusement park rides, entertainment, shops and food vendors. One of the best things about New Jersey is its location along the U.S. east coast. 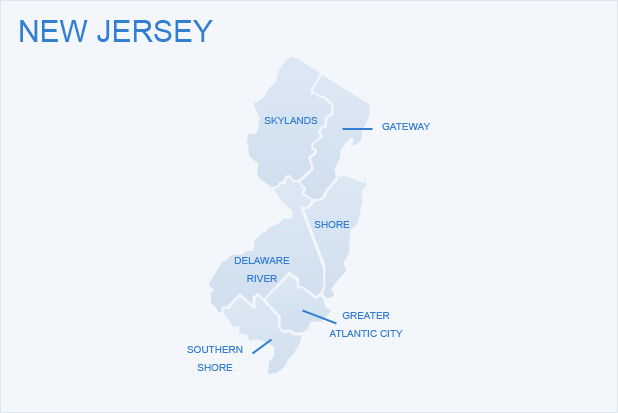 If you choose your New Jersey vacation rental wisely, you’ll be only a short drive from other major tourist destinations like New York City and Philadelphia. Visit these alluring cities during your New Jersey vacation or on your way home after a fun-filled trip. Guests staying in rentals along the shore should be sure to pick up local salt water taffy, a popular boardwalk souvenir for over a hundred years. For the ultimate selection of this sweet treat visit Shriver’s Salt Water Taffy in Ocean City, an iconic shop in the area. Another local favorite is pork roll, which is similar to ham and commonly prepared as part of a sandwich. Tomatoes, sweet corn, blueberries and cranberries are some of the state’s top crops, while fresh catch and seafood dishes are commonly enjoyed by visitors dining out or cooking at home in New Jersey vacation rentals. With no retail tax on clothing or shoes, New Jersey is an excellent destination for vacationers who like to shop. Smithville, a historic town 30 minutes from Ocean City, has over sixty shops to peruse. It is a charming town lined with cobblestone roads, and a perfect place to pick up a unique, handmade souvenir. New Jersey is also famous for its impressive amount of shopping outlet malls. The largest of the outlet malls in New Jersey is Jersey Gardens located off Highway 95. Whether it’s a relaxing beach vacation or an exciting city adventure, New Jersey has something for all vacationers to enjoy. 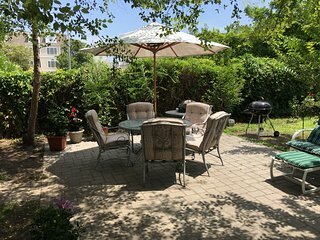 Location is key, so book one of the many New Jersey vacation rentals throughout the state for easy access to the attractions that pique your interest.